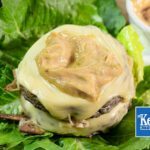 We've taken the recipe of a certain Big Burgers special sauce and made it low-carb and Keto Friendly with whole egg Mayonaisse and a Natural Sweetener. This is the perfect addition to your Keto Burger Bowls or as a dipping sauce! In a small mixing bowl, add all ingredients and mix well. Store in the fridge overnight to enhance the flavors. Serve on burgers, with meatballs or using as a dipping sauce for chicken wings.